This was our dessert on Valentine’s Day. My daughter saw a non-vegan version of fruit pizza in one of her magazine’s and kept asking me to make it. I am so glad that I finally gave in and made it. It was so good and I have never seen kids so eager to eat fruit before. This is a great recipe to get the kids involved in making. They can help with the cookie dough and help with decorating it with the fruit. I replaced half of the white flour in the cookie recipe with whole wheat white flour and it turned out really good. 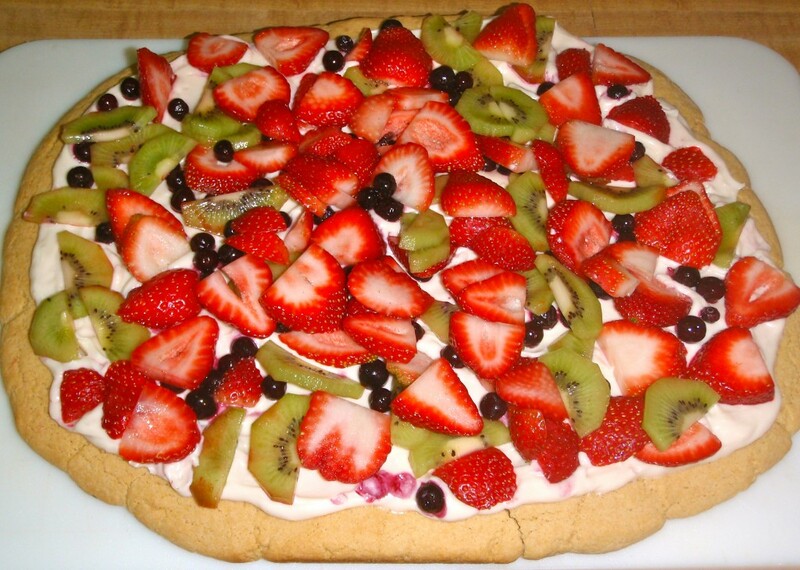 I think fruit pizza may be my new favorite dessert (except for chocolate of course). Preheat the oven to 400. Roll out the sugar cookie dough to about a 1/2 inch thick. You can make it round or rectangle depending on the shape of your baking pan. Line your baking pan with parchment or use a silpat. Bake the cookie for 12 minutes until the edges begin to brown. Keep the cookie on the pan for at least 1o minutes to harden enough to move to a cooling rack or you can leave it on the pan. Let the cookie cool completely. If you are using cream cheese mix it with the powdered sugar. Frost the cookie with cream cheese mixture or the frosting. Top with the fruit and chill for at least 30 minutes. Slice and serve.